It used to be that MotoGP teams could replace old engines with new ones whenever they wanted, and that the manufacturers could develop their engine technology throughout to the year, replacing older designs with new ones from race to race. That is no longer the case. With the engine regulations limiting teams to 5 or 12 engines per year, including a freeze on engine development for the factory efforts, MotoGP needs a sophisticated system for making sure these regulations are followed precisely. 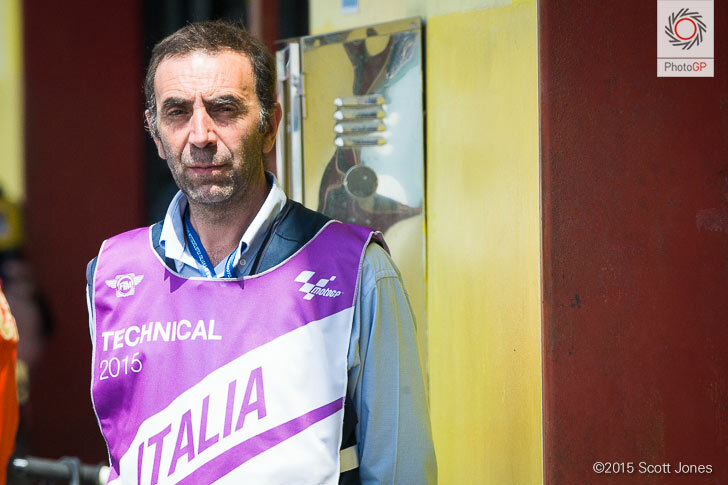 Jordi Perez, IRTA (International Racing Teams Association) Technical Inspector and Assistant to the Technical Director, is the man responsible for this. I spoke to him at Mugello about how he makes sure the teams follow the rules. A prefatory note about sealing engines as Mr. Perez refers to seals on the engines many times in the following interview: Engines are sealed when entered into the system, before their first use, so that the interior components cannot be modified or serviced, as required by the regulations. Teams cannot remove valve covers, separate cylinder head from crankcase, etc, without breaking these season-long seals. The engines are also sealed between use so that they may not be started or used away from situations allowed by the rules (race weekend sessions and official tests). These seals are in place whenever an engine is not in a book and available for use in al allowed session. Scott Jones: First of all, what is your role with IRTA? 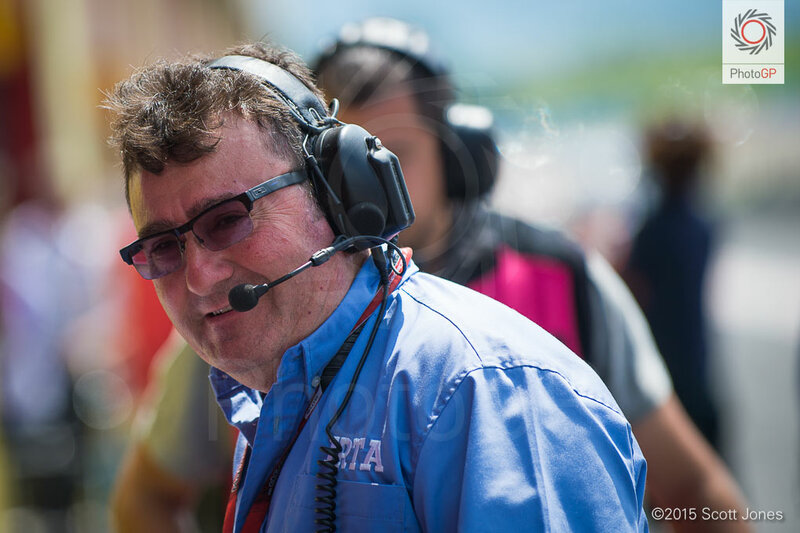 Jordi Perez: Basically I’m in charge of MotoGP engine control. SJ: Do you manage tire use as well, or anything else? JP: I do many things, but engines are my main responsibility. SJ: How does IRTA keep track of which engine is used in a given session? JP: As you know, the riders have an amount of engines for the season, five for the factories and 12 for the Open class. So when they bring us an engine for the first time we seal it, and after they use it for the first time they cannot change it. We know, always, where the engine is, even if they have some at the factory. We know which engine is in bike number one, which is in bike number two, and so on. Between each race, we seal each engine so they cannot be used, not in a dyno, not at a circuit, not at all. They can only be used under our supervision, when the rules say an engine can be used. SJ: How do you seal an engine to prevent improper use? JP: We have different methods, depending on if the engine is in the bike or not, but basically it’s some way to make sure the engine cannot be sparked. It might be as easy as removing something from the engine and replacing the cover with a seal. For example, one constructor might install a part in the engine that blocks the cam to make sure the valves aren’t damaged during transport. We can place a seal on that part so we know the engine did not run. On another it might be as easy as putting a cover on an exhaust port and sealing that. This control is not easy per se, but it’s perhaps the least difficult part of controlling the engine use. SJ: How about legal use, how do you track that? JP: That’s the most, perhaps not most difficult, but most laborious part of the process. We monitor the engines on the track electronically and manually. How do we do that? We always know which engine is in which bike. The rules say a new engine is in use when it crosses the pit lane exit line, which is when we receive the bike’s transponder signal. If it’s the first time or the twentieth time the engine crosses the line, we know when we get the transponder signal. The inspectors we have in each garage have a form they use to verify which engine is used. When they arrive they verify the engine numbers and track engine use all weekend. 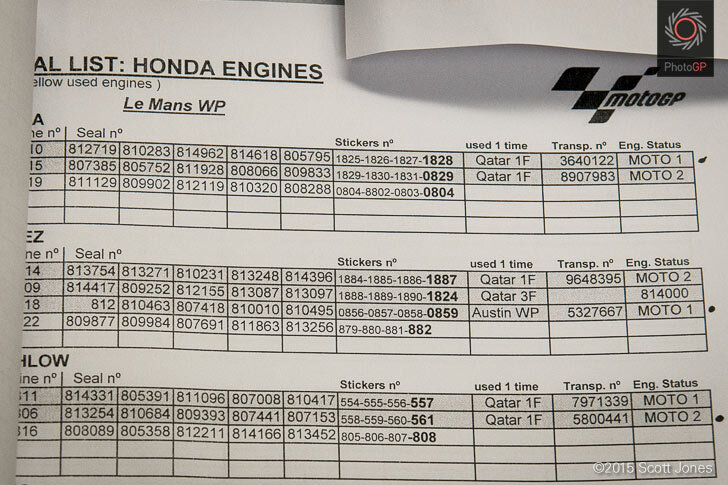 For example [now holding up a sample form], Melandri has 1, 2, 3, 4, 5 engines that are in the system. But in Le Mans, he has three engines, the 3, 4, and the 5. In FP1 he used bike #2 which had engine #3, and in bike #1 he had engine #5. Then for example, in the warm up, Aprilia entered into the system engine #6, which was put in bike #1. In bike #2 he still had engine #3. But he didn’t use bike #1, which I can see because it didn’t cross the pit exit line with the transponder signal from bike #1. But anyway, I have a person in each garage who via the form verifies which bike was used each time the rider left the box. And I know other details that help verify these things. For example, we know Aprilia is testing a seamless gearbox, so for sure there will be a new engine for that. This is a new system, so they will need an engine #6 to test it. So they put it into the bike, but I see from the other data that this bike was not used, it never crossed the pit lane exit and the inspector always verified use of the other bike in that session.